Today weather started with a short bright period but then the rest of the day was cloudy with intermittent drizzle and a strong 35mph SE headwind. Temperatures reached 21C but with freezing weather and snow back home we could not really complain. It was only the 2nd time in 4 weeks we had needed waterproofs on a moving on day. We headed out on a back road and joined the famed Great Ocean Road at Allansford 10 miles from our overnight stay at Warrnambool. We stopped for pictures of the signs and then on to the nearby Cheese World for elevenses. 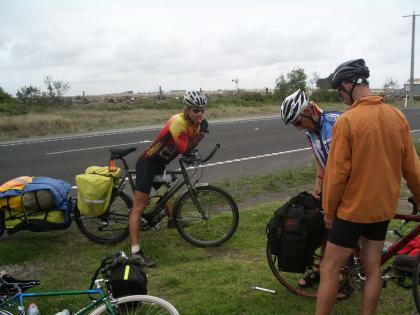 We were about to leave when the Canadian Round Australia Cyclist rolled up and we chatted to him and rode with him briefly later. We took a back route via Childers Cove where we stopped for a brief picnic lunch in some shelter from the wind. Then back onto the Great Ocean Road which eventually came down in line with the coast. 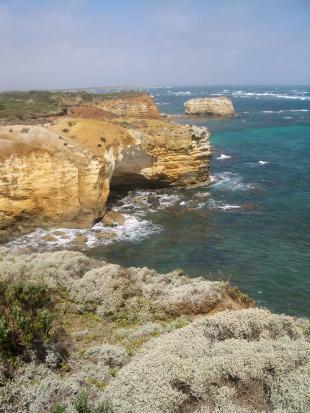 We stopped at the Bay of Islands viewpoint where the limestone coast is eroded with stacks left behind as islands. Luckily the sun came out briefly for photos. We stopped at the Bay of Martyrs and then on to the small town of Peterborough for tea. 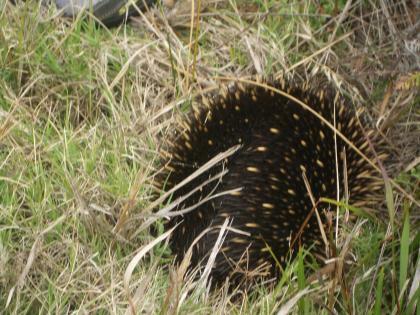 We crossed an estuary into the Port Campbell National Park and I spotted an Australian Ant Eater or Echidna all covered in spines on the grass verge. We stopped at 3 more viewpoints, The Grotto, London Bridge (an arch which fell down in 1990) and the Arch. Then on down to Port Campbell and our Best Western Motel. 48 miles for the day and 1046 ft of climb. Friday 9 February. Portland to Warrnambool. Weather today was generally cloudy with some sun in the afternoon. Temperatures reached 23C. Wind was still SE but much lighter and less of a problem. Today we had breakfast at a caf? overlooking the Harbor and started out soon after 9.00. Peter's bus overtook us about 9.30. We saw a couple of road signs warning of Koala Bears crossing the road but despite much scanning of trees none could be spotted. We stopped for tea and cake at the small town of Port Fairy. 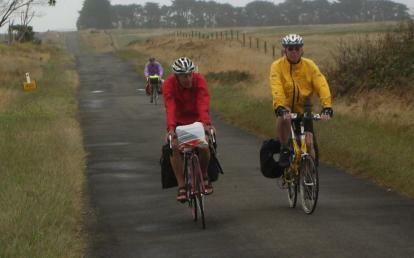 Then on to Warrnambool and we rolled up to the Motel just as Peter W returned from a stroll. 61 miles for the day and 666ft of climb. Thursday 8 February. 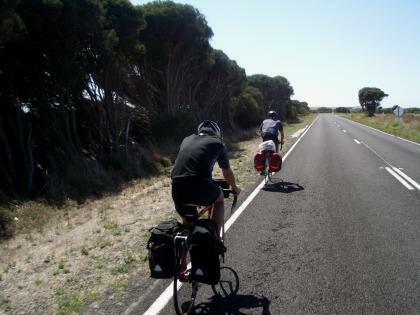 Mount Gambier to Portland. Today we briefly split with Peter W. On Mondays ride to Beachport Peter had a puncture and found the tyres on his folding bike which are not easily obtainable were very worn. He had ordered new ones from Melbourne by telephone on Tuesday but despite express delivery nothing arrived Wednesday. He had to wait for delivery today and stay another night at Mount Gambier and then get the 7.40 am and only bus tomorrow to our destination that day of Warnambool. Weather was mainly sunny today with short cloudy spells and a little cool compared to what we had become used to at 22C. Sorry to UK readers currently shivering at 2C. We headed SE on the C192 coast route with again a strong headwind but more shelter thanks to a rolling road and many trees. The road was relatively quiet with a vehicle about every 2 minutes but half of those were heavy lorries many carrying Chipping's for the Port with a strong smell of pine. We first headed south on flat roads to start with. We saw some Wallabies in a field by the road but they fled too quickly for pictures. Then across the Border back into Victoria State and a bit more Bike Lag with the clocks going forward 30 minutes so we had less time to do the ride. A few miles on we stopped at the small town of Nelson for brunch at a roadhouse (combined service station shop and restaurant) We all had beans on toast and a large apple pie and ice cream. The ride continued gradually climbing higher up to 600ft among pine plantations. We stopped at one point and watched a machine sawing the trees while holding them with a large grab handle and tearing them down. A short distance further on we saw a desolate landscape where trees had been sawn down bounded by a forest in the distance. 2 Emu had spotted us before we saw them and were running at speed across the open landscape towards the Forest. They looked like something out of Jurassic Park. Further on we stopped for an afternoon break at a clearing called Emu Flat. There were no towns for 40 miles between Nelson and Portland. 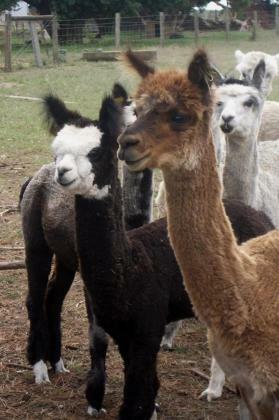 10 miles further on we stopped for an Alpaca moment at a small farm where a 20 strong herd of Alpacas gathered round curiously as we stopped and we chatted to the owners. When we reached Portland we checked into our 2 bedroom Apartment at the Victoria Lodge Motor Inn. It could fairly be described as the ideal accommodation for the Cycle Tourist with lounge kitchen area with microwave, dishwasher and walk in larder. As well as a very good shower the bathroom had a Spa Bath and also a washing machine and dryer into which our cycling clothes were deposited. After dinner at a pub where all 3 of us finished with sticky date pudding for desert we went on to the seafront to a Caf? for Coffees. Martin and I decided to try their sticky date pudding purely for comparison purposes. Peter was a little scandalised at 2 sticky date puddings each in one evening!! 65 miles for the day and 1666ft of climb. Today was a rest day with no moving on, based at the town of Mount Gambier 20 miles from the coast close to the Victoria Border. The town is built on the edge of an old Volcano with 2 major crater lakes and volcanic caves. Weather was cloudy at first soon clearing to sunny with temperatures reaching 21C. We had shopped the previous evening for breakfast and I cooked everyone porridge. After breakfast Martin rode his bike down the 40ft length of the Apartment lounge. We rode the bikes up through the town and then up to the Blue Crater Lake. This is a deep blue due to minerals in it. We rode a route round the Lake taking in lookouts en route. Then across to the other main Crater Lake, Valley Lake and a scenic route round to the Wildlife Park. This is a large area of woodland which is fenced off with wildlife roaming free and paths through the area. 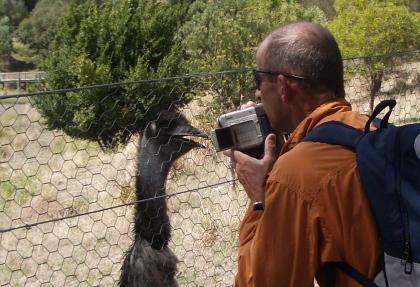 Our first encounter was an Emu which was quite close and curious and Martin got Video up to Beak for a close encounter of the Emu kind. 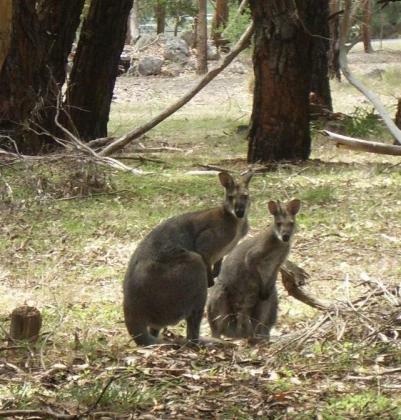 Further on we saw a mob (Australian for group) of Kangaroos relaxing in the shade of a tree. There were about 10 of them and we were able to get within about 15 ft of them. We searched for the one Koala supposed to hang out in the area but could not trace it. Later we saw 2 Wallabies in the woods. Peter T had a puncture as we rode away from the park which he soon fixed encouraged by the local flies. Then on into town for lunch. We also visited the nearby Cave Garden made in a deep hole in the ground by volcanic action. 8.7 miles for the day and 741ft of climb. Tuesday 6 January. Beachport to Mount Gambia. Today weather was sunny all day but cool? at only 21C. The wind was again a strong 25mph SE headwind all the way. The days ride may have been only just over 50 miles but due to the wind the effort was like climbing a hill for 50 miles. 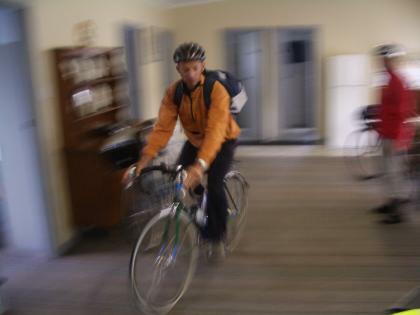 Very wisely Peter W decided to get the bus and was able to book his bike on and all went well. His bus left at 1.30 and his bus passed us at our tea stop. We started the day with breakfast in Beachport at a restaurant called Bompas. They produced our best breakfast of the trip to date. I had Museli drizzled with honey and covered with fruit and cream. Second course was Pancakes with maple syrup and cream! After 20 miles we reached the town of Millicent and stopped at a takeaway and caf? for lunch. The entrance had the common Australian door system of strips of plastic hanging down to keep out the flies. We started an after lunch conversation on the coolest way to get thought them and watched the locals in action. After lunch it was more hard riding into the wind until we gained a little shelter among pine forests and hills up to 200ft. 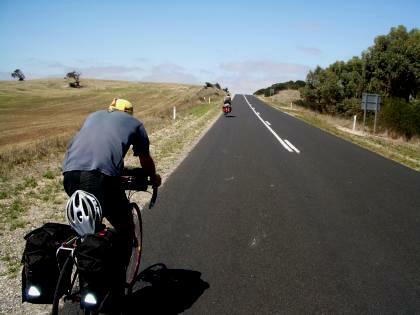 in South Australia outside main towns the hard shoulders were rough and gravelled and could not be cycled on. The big road train lorries generally gave us plenty of room. However they seemed to have no idea where the brake was. When they overtook us if traffic was coming the other way the other traffic drove onto the gravelled verge to get out of the way. Another part of the system seemed to be that if a smaller vehicle noticed a Road train coming from behind they would drive onto the gravelled shoulder to let it past. Today this combination led to a situation where we were cycling on the edge of the tarmac on the white line when a road train came past on the road. A smaller lorry meanwhile had pulled into the hard shoulder, saw us at the last minute and came by us on the gravel and verge at the same time that the road train passed us on the road. Braking didn't seem to occur to the driver of the smaller lorry, Durrr!!! When we got to Mount Gambier we checked into the Motel Avalon and a gigantic 4 bedroom cottage with a very large lounge. 52 miles for the day and 666ft of climb. Monday 5 February. Kingston SE to Beachport. Today weather started sunny but clouded over late afternoon (clouds? we hadn't seen those in a week) Temperatures dropped dramatically to only 21C. Peter T found this distinctly chilly. Wind was again a strong SE headwind and probably the worst day of the trip to date for wind. We headed south from Kingston with rush hour traffic amounting to none at all! Then it was the first of the days long flat straight roads exposed to the stiff 25mph headwind. Ahead of us we could see a fogbank over the coast which almost looked like a range of high hills. We did come to some hills eventually all of 90ft high through a forest. We stopped for elevenses at Mt Benson Winery and we all had soft drinks. Then on to the seaside town of Robe for lunch. Martin popped out of the bakery cafe for 5 minutes and returned having been to the Barbers for a quick haircut. Peter W decided to try to get a lift at Robe so the rest of us went on taking turns to battle against the wind at the front. On our right we passed 3 big lakes in the distance between us and the sea. To our left large fields were bounded by bushland and forest. 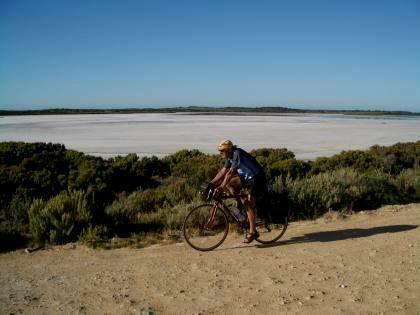 This scenery with flat straight roads and little traffic continued for 30 miles with no signs of habitation. I saw 2 Emu in the distance in a field between us and the forest. They spotted us and made off at quite a clip but ran in line with us for about a mile. There was no sign of Peter W at the Motel as it transpired he had been unable to get a lift and didn't arrive until 8.30pm after the Pub nearby stopped serving food at 8.00 so he had to make do with a snack for supper. A general comment is that we found all small Australian towns seemed to close down by 8.30 p.m. with nobody at all about. We had gone back to the Pub for drinks but were thrown out when they closed at 9.40!! 58 miles for the day and all of 164ft of climbing. 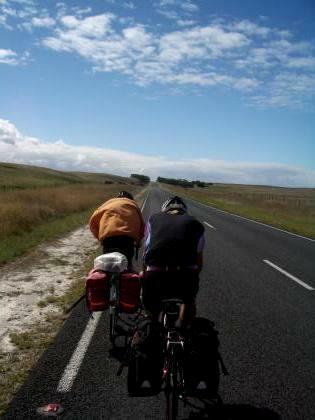 We have now been cycling in Australia for 3 weeks and mileage to date is 1130. Weather today was again clear blue skies all day and temperatures up to 40C. Wind was SE and a head wind or side wind. I got up early and took some pictures of the dawn and of the Moon setting over the Coorong lagoon. We had an early 7.00 am breakfast at the lodge restaurant of full English. Peter W had a head start while the rest of us chatted with the Aboriginal owners and watched a short video about the area and Aboriginal legends. We set off along the track with long shadows in the early morning light. The day produced a lot of wildlife sightings which can best be summarised as follows - " One live Kangaroo on salt flats, 6 dead roadkill Roos, 2 pairs of emu and 20 Cockatoos up a gum tree" The last is artistic license and were seen on another day but the rest were all seen today. Martin who should be called "Martin of the eagle eye" spotted a Kangaroo on the salt flats half a mile away as we rode the track from the lodge. I caused a little confusion in the pack by taking a short cut to the road which ran alongside the track and nobody noticed me riding alongside. When I got to the point where the track came out on the road I saw Martin and Peter T heading back up the track looking for me. They soon saw me and caught up. On the road Martin took the lead at time trial pace to our elevenses stop at the Salt Creek Road House. I amused myself by taking pictures of 2 bush fly's hitching a lift on Peter Ts back. Peter W had arrived at Salt Creek 5 minutes before us. There followed wilderness roads for 50 miles with no food stops. We stopped for lunch in shade by the roadside. The afternoon was notable for 2 Emu spotted in the distance by Martin. 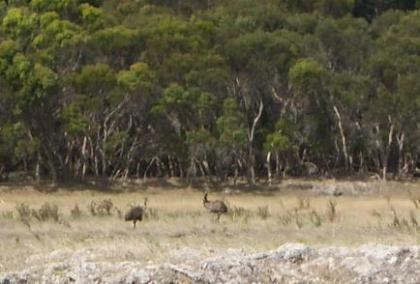 Then later I spotted 2 more Emu in a field near the road. With the heat and the headwind we collapsed exhausted and very sweaty into the first caf? we came to on the outskirts of Kingston. Peter W was following on at a much slower pace and very wisely got a lift for the last 16 mile. 75 miles for the day and 436ft of climb.